How to Clear Container From ANF Examination. Hello friends, first of all, thanks for your feedback on our previous post (how to create WeBoc`s child id), I hope you will like this post also. As we all very well aware about the fact, Weboc`s website only open in internet explorer, when we try to visit a WeBOC system`s website in other browsers & press login button so the system will show you alert a message box! Therefore, we are going to share some techniques with you, using this you can open WeBOC`s website in your mobile phones (Android or iPhone). 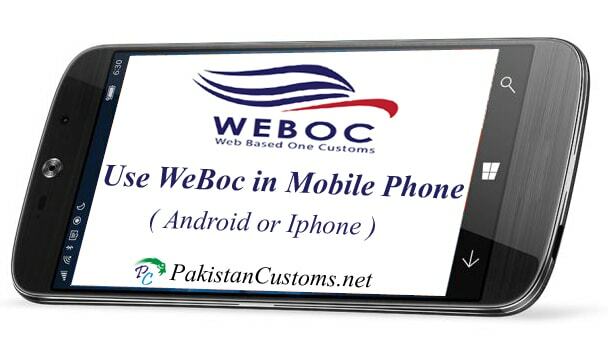 For iPhone User WeBOC`s Application is also available, but what about the android user, it’s also a true android user are more as compared with phones in Pakistan, Due to this reason we find out this JUGAAD for open WeBoc website in Android mobile. Let`s Start! What we do to open WeBOC`s website in mobile phones? We just need to install a dolphin browser in our mobile, in order to install this browser, we just type “Dolphin Browser” in Google Play Store and install. After login you turn on Java Script again and refresh the page, you will get full access of WeBOC options. Add Customs Clearing Agents License Number in Weboc. Find Container is Free For Use In Weboc. Container(is) already in customs process. What is Advance Payment (Terms of Payment in Export and Import) in Urdu and Hindi?